FILE - A woman photographs the sunrise at Ocean Park, in Old Orchard Beach, Maine, July 12, 2018. Ocean heat - recorded by thousands of floating robots - has been setting records repeatedly over the last decade, with 2018 expected to be the hottest year yet, displacing the 2017 record, according to an analysis by the Chinese Academy of Sciences. That is driving sea level rise, as oceans warm and expand, and helping fuel more intense hurricanes and other extreme weather, scientists warn. The warming, measured since 1960, is faster than predicted by scientists in a 2013 Intergovernmental Panel on Climate Change report that looked at ocean warming, according to the study, published this week in the journal Science. "It's mainly driven by the accumulation of greenhouse gases such as carbon dioxide in the atmosphere due to human activities," said Lijing Cheng, a lead author of the study from the Chinese Academy of Sciences. The increasing rate of ocean warming "is simply a signature of increasing greenhouse gases in the atmosphere," Cheng said. Leading climate scientists said in October that the world has about 12 years left to shift the world away from still rising emission toward cleaner renewable energy systems, or risk facing some of the worst impacts of climate change. Those include worsening water and food shortages, stronger storms, heatwaves and other extreme weather, and rising seas. 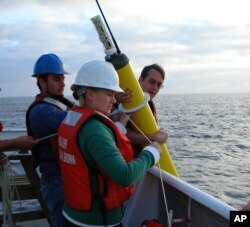 This photo provided by NOAA Corps shows the deployment of an Argo float to capture ocean temperature data. The system uses almost 4,000 drifting ocean robots that dive to a depth of 2,000 meters every few days, recording temperature and other indicators as they float back to the surface. Cheng explained that oceans are the energy source for storms, and can fuel more powerful ones as temperatures - a measure of energy - rise. Cheng said that the oceans, which have so far absorbed over 90 percent of the additional sun's energy trapped by rising emissions, will see continuing temperature hikes in the future. Because the ocean has large heat capacity it is characterized as a ˜delayed response" to global warming, which means that the ocean warming could be more serious in the future," the researcher said. "For example, even if we meet the target of Paris Agreement (to limit climate change), ocean will continue warming and sea level will continue rise. Their impacts will continue." If the targets of the Paris deal to hold warming to "well below" 2 degrees Celsius, or preferably 1.5C can be met, however, expected damage by 2100 could be halved, Cheng said. For now, however, climate changing emissions continue to rise, and I don’t think enough is being done to tackle the rising temperatures," Cheng said.